Lehigh student power-washing the outcrop as part of the service-learning project that developed the educational sign. The Allentown Formation is a dolostone [CaMg(CO3)2] originally deposited as a limy mud and sand in warm, shallow seas that once covered all of the eastern United States during the Late Cambrian Period (515-500 Ma). 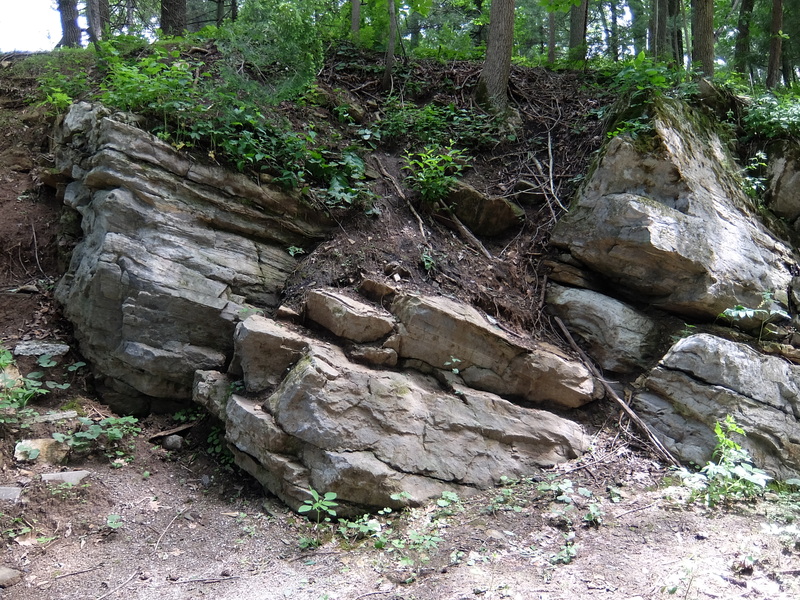 Underlying much of the southern Lehigh Valley and Saucon Valley, the Allentown Formation outcrops along the Saucon Rail Trail (SRT) near the border of Hellertown and Lower Saucon Township. The dolostone beds in the SRT outcrop dip gently to the south and exhibit characteristics consistent with numerous shallowing upward cycles, beginning as thick-bedded mudstone originally deposited in deep water, locally overlain by thin-bedded oolite-bearing calcarenite originally deposited in wave- and tide-dominated shallow water, overlain by intertidal, stromatolite-bearing mudstone. Among the most ancient organisms preserved in the fossil record, stromatolites are simple ecosystems of cyano-bacteria bio-film mats that trap carbonate mud and grow upwards in the photic zone. The stromatolites are numerous and range in size from < 1 cm to 50 cm in diameter. They are found today only in sheltered, saline environments but were much more common in the Cambrian oceans. 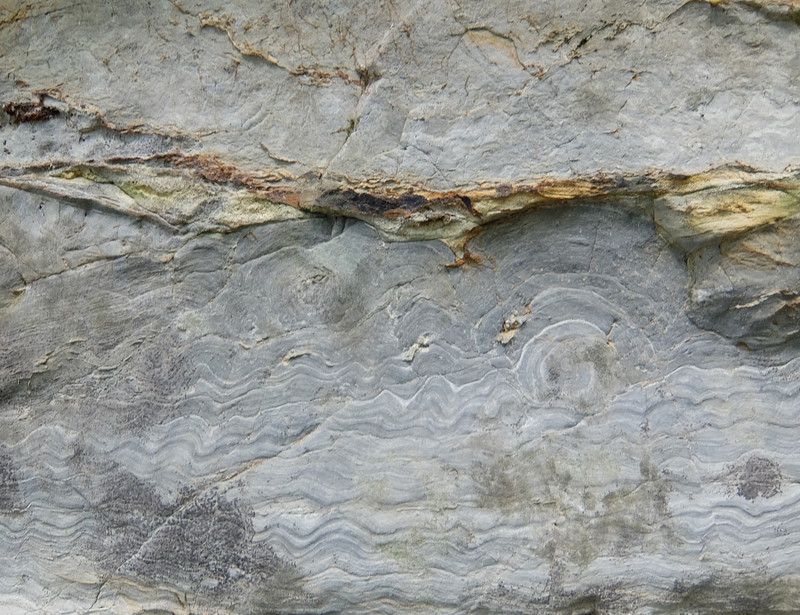 Several stromatolite forms and textures are present in the SRT outcrop. These include large, convex mounds (Fig. 2), wavy beds (Fig. 3), and small, concentric, round heads (Fig. 4). Fig. 2. Convex mound stromatolites. Fig. 3. Wavy bed stromatolites. Fig. 4. Round head stromatolites. Fig. 5. Modern stromatolites at low tide, Sharks Bay, Australia. Source. 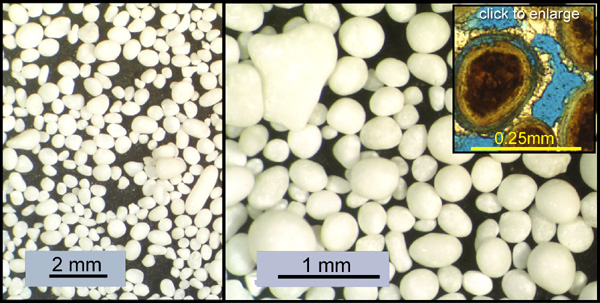 Oolites are beds that contain ooids, sand-sized sphericles of carbonate (Fig. 6). Ooids form when thin layers of carbonate mud adhear to a tiny particle such as a grain of silt or shell fragment, and grow by rolling and reworking by waves and tides. 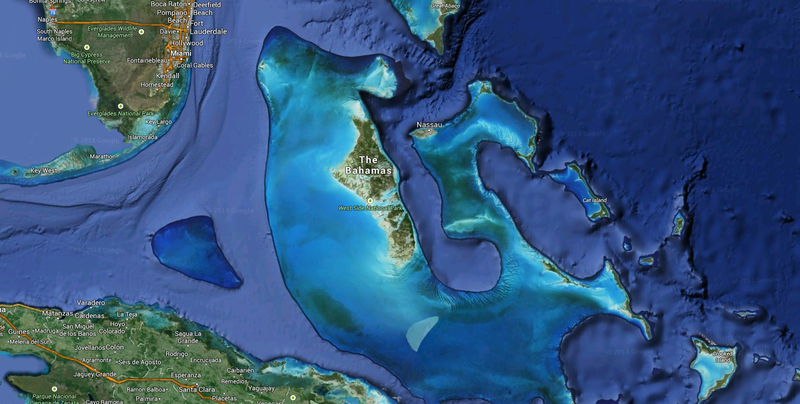 Ooids are a common component of beach sand in carbonate-producing warm seas, such as the Bahama banks (Fig. 7). Fig. 6. Ooid particles, note scale. Source. Fig. 7. Ooid-rich beaches of the Bahama banks. Source. Fig. 8. 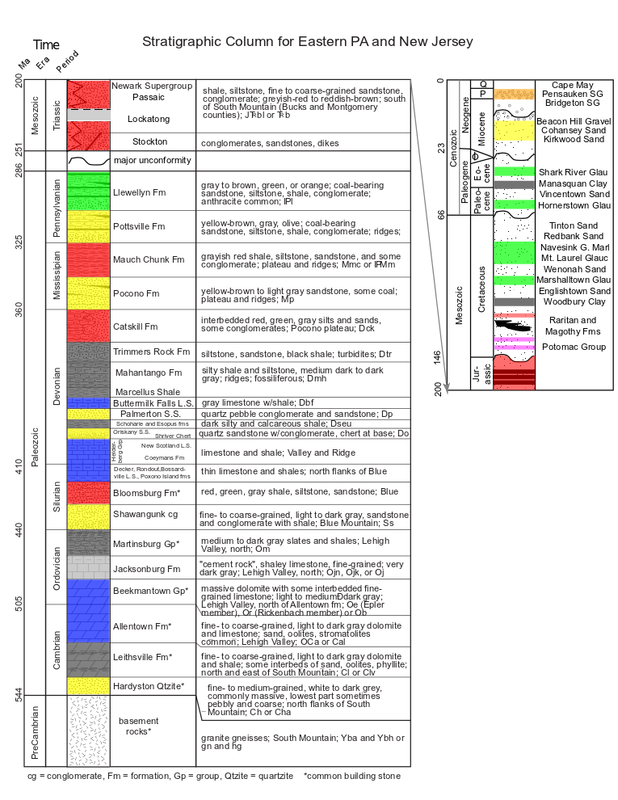 Stratigraphic column of eastern Pennsyvania and central New Jersey. The Allentown Formation is one part of a very thick package of sedimentary rock that underlies eastern Pennsylvania (Fig. 8). These rocks were originally sediments deposited in a series of basin that formed as the the Appalachian Mountains were being built from ~500 to 250 Ma. When the Appalachians were being rapidly uplifted by the collision of landmasses and volcanic island arcs, siliciclastic detritus was shed into the basins by rivers, forming deltas and reworked into beaches and marine deposits by currents and waves. When mountain building waned, the basins were flooded by the ocean that accumulated thick deposits of carbonte mud. Most carbonate sediments were originally deposited as the minerals calcite or aragonite [CaCO3] forming limestone. Later, during burial and the movement of fluids, the limestone was transformed into dolostone [CaMg(CO3)2]. The age of the Allentown Formation, like all of the rocks in this stratigraphic column, is known from their fossils, the study of biostratigraphy, anchored by radiometric numeric ages on volcanic ash beds that occur at several places in the column. Fig. 9. 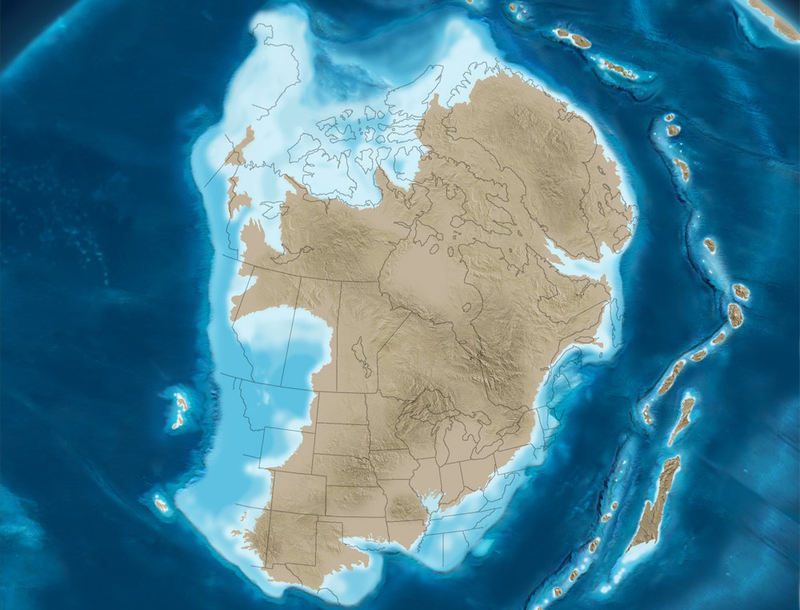 Late Cambrian North America. Source. The Allentown Formation was deposited in a passive margin basin that existed on the east coast of North America before the rise of the Appalachian Mountains. At this time, North America was near the equator, and actually facing south. Fig. 9 adjacent depicts North America during the late Cambrian 510 Ma when the Allentown Formation was being deposited in eastern Pennsylvania. Note that most of Pennsylvania was under a shallow ocean at this time. The subsequent rise of the Appalachain Mountains changed the geography of eastern North America and deformed the sedimentary rocks that had been deposited there, including the Allentown Formation. The results of that mountain building and deformation is evident in the geologic map of Pennsylvania, the Saucon Creek watershed portion of which is presented here in Fig. 10. Note the location of the SRT outcrop. A prelimary, uncolored USGS geologic map and report of the Hellertown Quadrange is also available. Limestone and dolostone are important economic resources in the state of Pennsylvania. They are used for building stone, as a flux in steel making, as an essential ingredient in Portland Cement, and as aggregate in road and building construction. More information about limestone and dolostone economic uses can be found here. Geologists understand the history of Planet Earth through observation, comparison of past processes to those operating in the present, and by the rigorous, repeatable testing of hypotheses following the scientific method. These principles of knowing and understanding have been applied to the rocks exposed in Pennsylvania and collectively they are the foundation of the State's geologic evolution that guides us in our use of its economic resources. How do we know that the Allentown Formation was originally deposited in a shallow ocean? 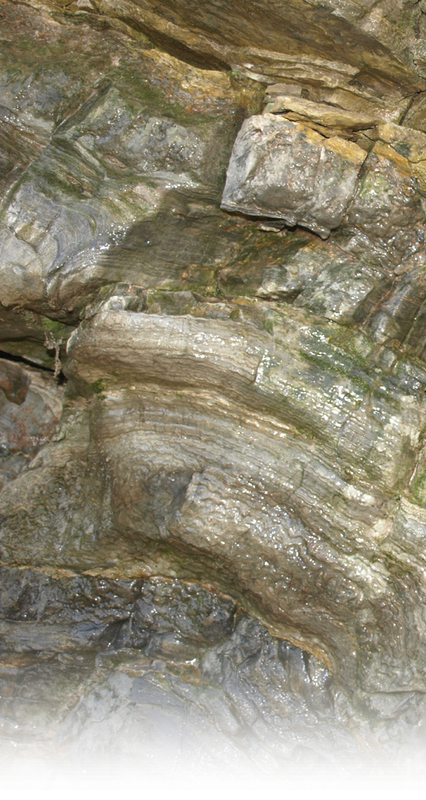 There are many features in the SRT outcrop that lead to the clear inference that the Allentown Formation dolostone was originally deposited as a limy mud in a warm, shallow sea. Among these are the oolites, wave ripples (visible on the blocks used to make the steps), and the stromatolites. All three of these features are common to modern limy mud-bottom shallow seas in warm, tropical areas. We know that the water must have been shallow because the stromatolites we observe at the SRT outcrop are of the type that form in tidal regions, like Shark Bay, Australia, where they are regularly exposed during low tide. With the exception of some lakes, virtually all of the modern limestone and dolostone deposition occurs in the oceans. How do we know the age of the rocks exposed at the SRT outcrop? The enormous depth of geologic time is a difficult concept for us to comprehend, given that human lifetimes are measured in tens of years, rather than the hundreds of millions of years that represented by the sedimentary rocks exposed in the Saucon and Lehigh valleys. Considering the crystalline rocks of South Mountain, the geologic history of eastern Pennsylvania extends back past 1 billion years. Geologists use two key tools to document deep geologic time and develop a time-stratigraphic framework that can be extended and used globally. These two tools are (1) direct radiometric dating of minerals using decay of radioactive elements and (2) biostratigraphy, which is the study of the history of life, including extinctions. Radiometric dating of minerals is grounded in the firm physical laws that govern radioactive decay of long half-lived elements such as uranium, rubidium, or potassium, to their corresponding daughter products of lead, strontium, and argon. In closed minerals where the amount of radioactive parent and corresponding daughter element are conserved, radioactive decay is accurate clock of the age of mineral formation and incorporation in a geologic horizon. For eastern Pennsylvania, there are several geologic horizons formed of ancient volcanic ash that contain the mineral zircon, formed as a product of the volcanic eruption. Zircon is a good mineral to date because it contains uranium that can take advantage of the uranium-lead radiometric method. These ashes lie in the Marcellus and Jacksonburg formations in the stratigraphic column of Fig. 7 above. 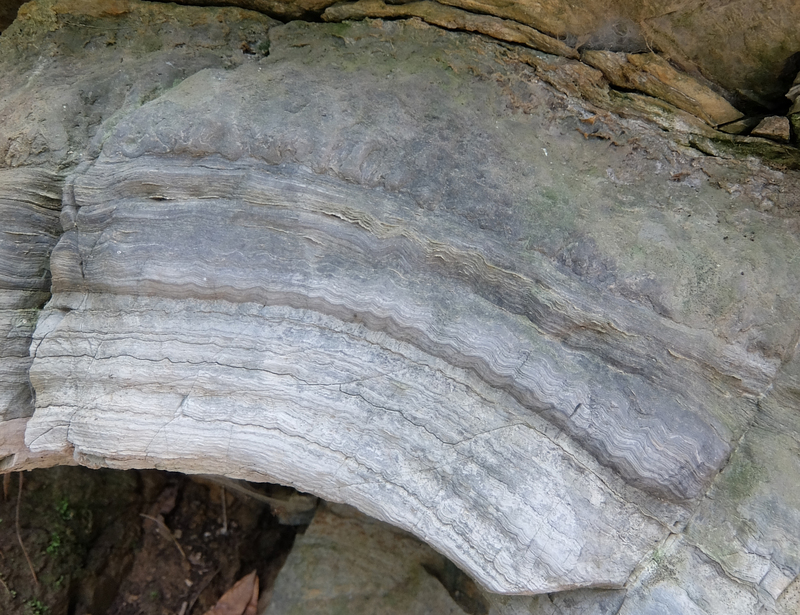 Because these sedimentary rocks are stratigraphically above the Allentown Formation, we know that they must be younger than the Allentown Formation, so the Allentown Formation cannot be younger than ~460 million years. Similarly, zircons in the crystalline rocks of South Mountain that are stratigraphically below the Allentown Formation have been dated to ~1 billion years old. 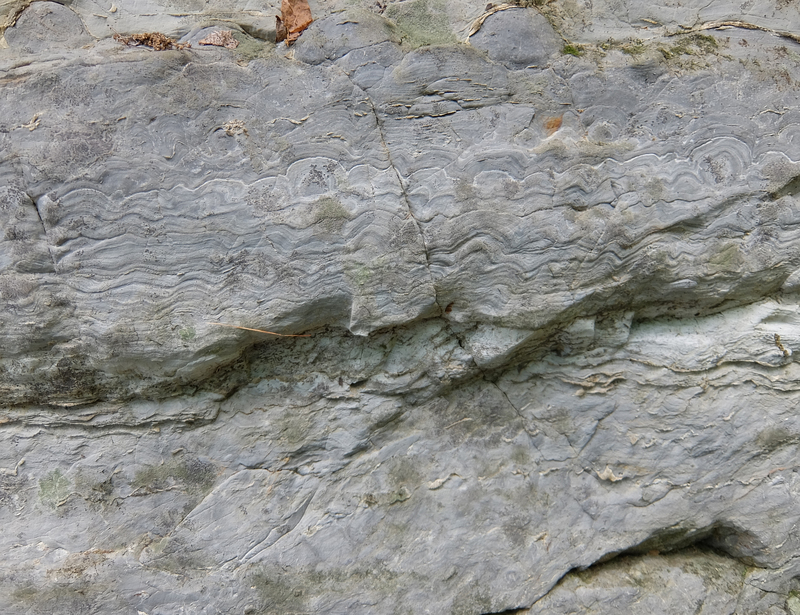 Because these rocks are older than the Allentown Formation, we know from direct radiometric dating in eastern Pennsylvania that the Allentown Formation dolostone must be between ~ 1 billion and 460 million years old. Fig. 11. Conodont teeth, note the 1 mm scale. Source. The second and defining clue to Allentown Formation age come from biostratigraphy and biostratigraphic correlation to deposits elsewhere that also have direct radiometric ages. The stromatolite fossils are helpful in knowing the depositional environment, but not terribly diagnostic for biostratigraphy because stromatolites have been present as fossils for over 3 billion years of geologic time. However, the Allentown Formation also contains microfossils of the mouth parts and teeth of an extinct chordate resembling a tiny eel called a conodont (Fig.11). Conodonts were very common in the world's oceans hundreds of millions of years ago, they were widespread, and they evolved fast, meaning that new species arose and went extinct frequently. 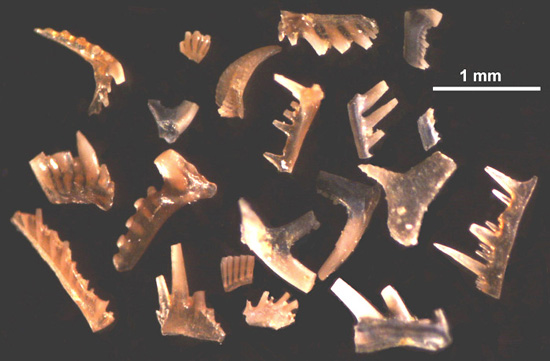 The Allentown Formation contains conodonts that are known to have lived between 500 and 515 million years ago because elsewhere in the world, these same conodont fossils have been found with interlayered material like cvolcanic ash, that has been radiometrically dated to this interval. Biostratigraphy provides a powerful tool that geologists have used to build the geologic time scale for our planet. Also, check out the online web mapping app.